This organization shall be known as “Basketball Officials Committee of the Louisiana High School Officials Association.” (“Basketball Committee”). This organization is a Sports Division created by authority of the Louisiana High School Officials Association (“LHSOA”). The organization will abide by and follow the rules of the LHSOA. To increase participation in Basketball officiating and to assist statewide projects in recruitment and retention of Basketball officials. To serve as a single voice for local Basketball official associations for promotion of their rights and welfare. To promote the rules knowledge and mechanics, as well as closer cooperation among officials, coaches, players and administrators through a high standard of ethics, fair play, sportsmanship, and professionalism. To serve as a representative group of Basketball officials in which ideas of general interest may be discussed and to which they may be referred for the friendly exchange of information resulting in better relationships. To promote fair play, professionalism, understanding, and respect among officials, players, coaches, administrators and the LHSAA. To provide structure and promote consistency among all Basketball officials and Basketball officials associations. To make recommendations to the LHSAA Director of Officials regarding Basketball rules and officiating policies, philosophies, and mechanics. Fostering a high standard of ethics, professionalism, close cooperation, and better understanding among officials, Athletic Directors, Principals, coaches, players and the media. Section 1 – Overall Composition of the Basketball Committee. The Basketball Committee shall be comprised of designated members from local Basketball officials associations, as recognized by the Louisiana High School Athletic Association (“LHSAA”), representatives from the LHSOA Executive Committee, and representatives from the LHSAA, as further set forth in this Article. No active Assignment Secretary of a local Basketball association shall be a member of the Basketball Committee. The Basketball Committee shall have a Chairman and Secretary, but the Committee shall have no other officers. Section 2 – Local Association Representation on the Committee. The President of each local Basketball officials association recognized by the LHSAA, or such President’s designee, shall be a member of the Committee. For purposed of this section, such person shall be the only local association representative voting member from the respective association on the Committee. Section 3 – LHSOA Representation on the Committee. The LHSOA Basketball Representatives from the LHSOA Executive Committee serve as the LHSOA representation on the Basketball Committee. Section 4 – LHSAA Representation on the Committee. 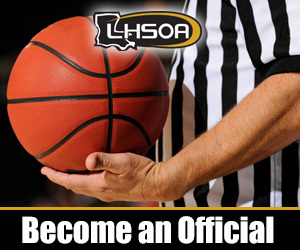 The LHSAA Director of Officials shall serve as a member of the Basketball Committee. He may take part in any discussion, may introduce motions and resolutions, but shall have no vote on any matter. Section 5 – Chairman of the Committee. One of the LHSOA Representatives, as chosen by the LHSOA President, shall preside as Chairman of the Basketball Committee. Section 6 – Duties of the Chairman. The Chairman shall preside at all meetings of the Basketball Committee. The Chairman shall take care to execute all orders and resolutions of the Basketball Committee and shall perform all duties incident to his office as well as those that may be required by the Basketball Committee. He shall call special meetings of the Basketball Committee as needed. He shall provide for the appointment of standing committees and appoint special committees as needed. Section 7 – Secretary of the Committee. One of the LHSOA Representatives, as chosen by the LHSOA President, shall preside as Secretary of the Basketball Committee. Section 8 – Duties of the Secretary. The Secretary shall issue notice of all meetings of the Basketball Committee. He shall record and maintain minutes of meetings, maintain custody of all legal documents including the LHSOA Constitution Basketball Committee bylaws, as well as the LHSOA membership roster for all Basketball officials. He shall serve as custodian of records for The Basketball Committee. He shall communicate with local Basketball official associations and shall obtain the names of those persons who shall serve as members of the Basketball Committee. He shall perform such other duties incident to the office or which may be required by the Basketball Committee or its Chairman. He shall, in consultation with the LHSOA Treasurer, inform the Basketball Committee of any financial matters relating to the Basketball Committee. Section 9 – Terms of Office. The Basketball Committee members and shall serve a two-year term, and shall assume their offices on the first Saturday in June. The Basketball Committee shall be the judge of the election, returns, and qualifications of its own members, but it shall accept, upon satisfactory documentation, the appointment to the Committee from each local Basketball officials association. Section 10 – Meetings. The Basketball Committee shall conduct business at an annual meeting during its term, and shall also hold special meetings as necessary. Except as otherwise noted herein, all meetings shall be conducted according to the most recent version of Robert’s Rules of Order. Seven (7) members of the Basketball Committee shall constitute a quorum to do business. Section 11 – Regular Meetings. The annual meeting shall be held and conducted as set forth herein. Summer/Fall Meeting. This meeting shall take place within the months of August – November. At this meeting, in addition to any regular business, the Basketball Committee shall consider any action necessary relating to rules, policies, philosophies, and mechanics in preparation for any spring practices. Further, the Basketball Committee shall elect its representatives to the LHSAO Executive Committee. Section 12 – Election of Members to the LHSOA Executive Committee. The Committee shall select its four (4) representatives to the LHSOA Executive Committee at its annual meeting from candidates submitted by the local association representatives prior to the member’s term expiring. All elections are subject to the requirements of the LHSOA Constitution. Section 1 – Ratification. These Bylaws shall become effective upon approval by a majority vote of the LHSOA Executive Committee. Adopted by the Basketball Ad Hoc Committee at Alexandria, Louisiana, on October 17, 2010. Approved by the Executive Committee of the Louisiana High School Officials Association, this 7th day of November, 2010.